This tutorial explains SAS macros with practical examples. SAS Macro programming is considered as an advanced SAS. Knowing SAS Macros is an advantage in the job market over other candidates. Upon completion of this tutorial, you would understand how to create macros and where they can be used. It's generally said smart programming reduce workload and helps to win over your boss. Macros are used to automate the repetitive task. It can make your work faster by automating the task that requires writing same lines of code every day. It can also be used when you design a complex algorithm and want to make usage of code user friendly so that people who are not comfortable with programming can use your algorithm. A macro variable is used to store a value. The value is always character. The character value can include variable-name, letters, numbers or any text you want substituted in your program. Local - If the macro variable is defined inside a macro code, then scope is local. It would be available for use in that macro only and gets removed when the macro is finished. 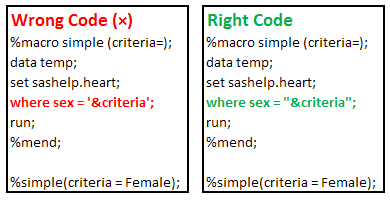 Global - If the macro variable is defined outside a macro code, then scope is global. It can be use any where in the SAS program and gets removed at the end of the session. The following is a list of various ways to create a macro variable with examples. It can defined inside or outside a macro. Notice that unlike the PUT statement the text string is not enclosed in quotes. The quotes are not needed because, unlike in the DATA step, the macro facility does not need to distinguish between variable names and text strings. Example : Suppose you are asked to write a macro that returns mean value of a variable. The analysis variable, input and output data sets are dynamic. In the above code, test is a macro, input, ivar and output are local macro variables. In this case, we are giving flexibility to users to provide information of input dataset name, the analysis variable and output dataset and the macro returns the mean value of the analysis variable in the output dataset. How to use conditional processing %IF %THEN ? It is used to perform mathematical and logical operation with macro variables. %let last = %eval (4.5+3.2); returns error as it cannot perform arithmetic calculations with operands that have the floating point values. It is when the %SYSEVALF function comes into picture. 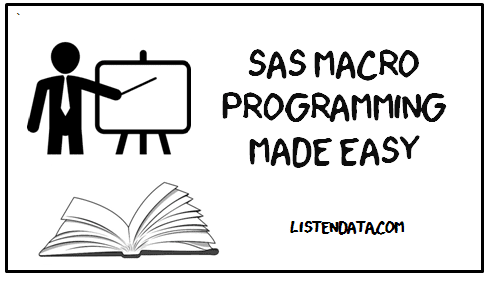 There are several useful Base SAS function that are not directly available in Macro, %Sysfunc enables those function to make them work in a macro. Usage I : This function removes the normal meaning of following token + – * /, > < = ; “ LT EQ GT LE GE LE NE AND OR NOT blank. Suppose we need to store PROC PRINT; RUN; command in a macro variable. Since the semicolon following PRINT terminates the %LET statement. It does not consider RUN statement. To workaround this issue, let's use %STR function. If you would not use %STR function in the above example, you would not be able to store quotes in a macro variable. Usage III : It also preserves leading and trailing blanks of the string. %NRSTR works similar to %STR works except it does not resolve the % and & but stop the macro triggers. Result : "Difference between &SYSDATE9 and 23DEC2016"
In the above case, %NRSTR() stops the &SYSDATE9 macro function. It returns the nth word in a string. Suppose you have 3 macro variables and the third variable is actually a concatenation of the first 2 variables' value. Suppose you have a list of names and you want to store them in a macro variable. It can be done by using SEPARATED BY ' ' keyword in PROC SQL. In this case, we have used comma(,) as a delimiter. We can use any other delimiter. MPRINT translates the macro language to regular SAS language. It displays all the SAS statements of the resolved macro code. It is very helpful when we deal with nested macros (Macro inside another macro). Often we use %DO loops and or %IF-%THEN-%ELSE statements inside the macro code and LOGIC option will display how the macro variable resolved each time in the LOG file as TRUE or FALSE. MLOGIC(TEST): %DO loop beginning; index variable I; start value is 1; stop value is 9; by value is 1. MLOGIC(TEST): %DO loop index variable I is now 2; loop will iterate again. It writes the results of resolving macro variable references to the SAS log for debugging. See the log generated by these two options. MPRINT option prints all the statements within the macro (not just macro variables). Whereas, SYMBOLGEN option prints only the results of macro variables. All of these options can be turned off together as specified above. Or one of them can be turned off and remaining ones keep turned on. 1. Use double quotes to reference macro variables. 2. The quotes are not needed in %PUT. 3. Use Proc PRINTTO for saving log in an external text file. Suppose your macro is stored in a location and you need to call it from the location. You can accomplish this task using %Include. 31 Responses to "SAS Macros Made Easy"
My intension is to create a macro variable called MAC1 to MAC&mx1 that will hold the macro names. Eg.for filename AREA mac1 will hold value as "Inserted", mac2 will hold "deleted" and so on. NOTE : &mx1 will be clear from below given code. Desired value of mac1 = inserted, mac2 = deleted, mac3 = dropped. But it is getting displayed in log as mac1 = deleted, mac2 = dropped, mac3 = inserted. Can anybody plz help to get the desired output. Could someone please tell me that a SAS Macro use PDV or not. If yes then in what circumstances because how much i know Macro facility does not have PDV. Deepanshu could you please add a page about this in SAS Macro section. If you could then i will be very much thankfull to you. I guess you are confusing yourself by comparing SAS PDV with SAS MACRO Processing, both are different. SAS PDV get created while data step processing while SAS macro gets processed by SAS macro processor. Nice tutorial. Heowever, you mentioned %LET. Does it work? It works. Please let me know if you face any issue(s) related to it. Plz, can u give explanation about autocall macros.? awesome blog man! keep it up! i have below mentioned data. i made below macro for same. Can anyone tell me how to make macro of dates. Like i make flowertype and its ginger when i will mention any flowertype in macro then it will give me print. Same way i want to make macro of Date. if i will mention particular date then macro will show me the result of that date only. I Have similar data like given in the following dataset. What i am trying to do is subset the data for each value of location. I have written the following macro. I understand that it will not work because of the spl char and to mask or remove the meaning of them we have to use %STR function. But I am not understanding where to use that %STR function. It is very helpful. Thank you so much! suppose we have a data set consisting of the monthly income of a group of people over the years and we have to extract the income data of every third month of the people. how it could be done using macros? hi..i'am unable to run macros in SAS studio..can any one help? ?